As you aware CRM dynamics 2011 beta was released in September 2010, now following is link to register for global launch of Dynamics CRM 2011 on 20th January 2011. Also Dynamics CRM 2011 Release Candidate (RC) is now available for download in the Microsoft Download Centre. 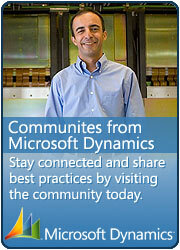 Following is details for the same from Dynamics CRM Team Blog. This entry was posted in CRM 2011 and tagged Dynamics on December 15, 2010 by mayankp. You have been a great help for me in CRM community – resolved most of my issues. I’ve been working in crm 4.0 for past 1.5 yrs. Now that I’ve to decide whether to continue on CRM or SharePoint. I would like to know the future of this technology… and the job opportunities across the world. Do u recommend going with this technology… Kindly suggest any links which helps to my decision making… thanks in advance. Thanks for your comments, you are welcome!! Now regarding future and job opportunities regaring CRM will be bright, One of the reason I say that becuase CRM products always have been key part of any Organization. ( i.e. before mircosoft CRM it was others like SAP, Sales force, siebal etc..)..